The Forks (French: La Fourche) is a historic site, meeting place and green space in Downtown Winnipeg located at the confluence of the Red River and the Assiniboine River. For at least 6000 years, the Forks has been the meeting place for early aboriginal peoples, and since colonization has also been a meeting place for European fur traders, Métis buffalo hunters, Scottish settlers, riverboat workers, railway pioneers and tens of thousands of immigrants. The Forks was designated a National Historic Site of Canada in 1974 due to its status as a cultural landscape that had borne witness to six thousand years of human activity. The site's 5.5-hectare (14-acre; 0.021 sq mi) grounds are open year-round. Numerous archaeological digs have shown that early Aboriginal groups arrived at The Forks site around 6,000 years ago. The digs conducted between 1989 and 1994 discovered several Aboriginal camps. Artifacts related to the bison hunt and fishing were unearthed. Evidence showed that Nakoda (Assiniboins), Cree, Anishinaabe (Ojibwa) and Sioux (Dakota) visited the site. Seasonal migration routes from northern forests to southern plains featured the Forks area as a rest stop, and the location became a key transcontinental trade link. The Assiniboine River has followed its modern course for approximately 700 years. The Assiniboine River formerly met the Red River near the present-day mouth of the La Salle River. European fur traders arrived at the site and initiated trade with the local peoples, using the Assiniboine people as fur trade middlemen. Europeans arrived by canoe in 1738. La Vérendrye erected Fort Rouge, the first of a long line of forts and trading posts erected in the area. The Red River Colony and the forts were all established near The Forks. The area remained the hub of the fur trade up until the 1880s. At that time, grain production became Western Canada’s principal industry and the main transportation for that industry was rail rather than waterways. During the smallpox epidemics of 1781–1782, over half of the area's aboriginal population died. At this time over 1,000 Aboriginal men, women, and children were buried in The Old Aboriginal Graveyard at The Forks. From 1760 to 1821, the Hudson's Bay Company and North West Company competed for furs. Both companies used The Forks to store and ship supplies and furs. By 1821, competing fur companies were amalgamated into the Hudson's Bay Company. The rail yards of the Northern Pacific and Manitoba Railway Company, the Canadian Northern, the Grand Trunk Pacific Railroad and the Canadian National Railway were dominant facets of the Forks site, and this era is responsible for some of the buildings still standing at The Forks. The Forks Market was formed by joining together the Grand Trunk Pacific Railway stable and the Great Northern Railway stable and Johnston Terminal was originally known as the National Cartage Building. The Manitoba Children’s Museum is housed in what used to be the Northern Pacific and Manitoba Railway Company’s Buildings and Bridges (B & B) Buildings. Union Station is still in operation. Across the Prairies the Canadian government began actively promoting immigration, settlement and railway development in the late 1800s. The Canadian government erected two immigration sheds at The Forks, each accommodating up to 500 people. The Forks now[when?] contains public space for celebrations and recreation, an interpretive park, revitalized historic and new buildings containing shops and restaurants, as well as a skateboard park and historic port. The Forks attracts over four million visitors each year. Beginning as two adjacent stables for competing rail companies, the horse stalls were joined together by a courtyard and bridges and became what is now known as The Forks Market. The Forks Market features a six storey tower with viewing platform, which is accessible by stairs or elevator and features interpretive panels with information on the site's history. The market also comprises two storeys of vendors selling everything from fresh fruit, bread, meat, and wine to cigars and aromatherapy products to crafts and artworks from 300 local and Canadian artisans. In mid-2016, the Forks completed a $2.5-million renovation of the food hall into a feature called The Common, including a new beer and wine kiosk. Across the courtyard from the Forks Market is the four-storey Johnston Terminal building. Originally constructed in 1930, the terminal was a warehouse and freight-forwarding facility erected by Carter-Halls-Aldinger Company, and cost an estimated $134,700. After a substantial addition in 1930, the warehouse was at the time one of the largest in Winnipeg, containing over 9,300 square metres (100,000 sq ft) of usable space. It was occupied by National Storage and Cartage until 1961, and was leased to the Johnston National Cartage Company for the next 15 years. Vacated in 1977, the building was unoccupied until the redevelopment of the site into The Forks. The building is now home to a variety of specialty boutiques and stores, offices, a café, Finn McCue's and The Old Spaghetti Factory. The basement of the building hosts the Johnston Terminal Antique Mall, which features over 30 consigners and 7,000 square feet (650 m2) of new merchandise brought in daily. Travel Manitoba Visitor Information Centre – Forks Location is the visitor information centre for Manitoba, offering travel counseling and trip planning services. The centre also acts as a meeting point for the "6,000 Years in 60 Minutes!" Parks Canada interpretive program offered throughout the summer months. Located next to the Oodena Celebration Circle, the Manitoba Children's Museum is a non-profit, charitable children's museum featuring twelve permanent galleries. Originally opened at a different location in 1986, the museum's moved to its current building at the Forks in 1994. The museum is now housed in the former Kinsmen Building, which is the oldest surviving train repair facility in Manitoba, having been built in 1889. The museum underwent $10 million in renovations in 2011, including the addition of the Buhler Welcome Centre. The Manitoba Theatre for Young People (MTYP) is a theatre for children and young adults, located at the Canwest Performing Arts Centre in The Forks, Winnipeg. The location provides 28,000 square feet (2,600 m2) of space for the theatre to use towards its missions of producing entertaining professional theatre, providing training in theatre and portraying the experience of Canadian children. MTYP's Theatre School offers Fall, Winter, and Spring sessions, as well as Spring break and Summer camps, including classes for children as young as three years old. MTYP offers free acting, performing and film training classes to Winnipeg's Aboriginal youth between the ages of 12 and 18. The Forks is the location of the Canadian Museum for Human Rights (the first national museum outside of Ottawa). Its construction was completed in 2014. The site for the museum is one of archaeological importance relating to First Nations history. Inn at the Forks is a five storey hotel located at the Forks. It has 117 guest rooms and suites, meeting and reception space for up to 200 people, fitness facilities, and features The Current Restaurant & Lounge and Riverstone Spa. The hotel features natural slate floors in the main lobby, glass vanities in the suite washrooms, heated floors, and a water wall in the spa. The Inn at the Forks project was the first Canadian application of the “Redi-Maid” system that links ensuite occupancy sensors, lighting and mechanical system controls to staff PDAs with the goal of maximizing energy efficiency. The hotel was completed with a construction cost of $16 million in May 2004. The Winnipeg Rail Museum is located at the historic Union Station adjacent to the Forks. It is home to the Countess of Dufferin steam locomotive, the first locomotive to enter Western Canada. The Forks features numerous outdoor facilities, sculptures, and landscape features open to the public. During winter, the following skating rinks, trails and snow park structures are erected at the Forks. In January 2008, the Guinness Book of World Records recognized The Forks as the home of the longest skating rink in the world. The 8.54-kilometre-long Assiniboine Credit Union River Trail on the Assiniboine River and the Red River is almost 1 kilometer longer than the previous record-holding rink. The 7.8-kilometre long rink on the Rideau Canal in Ottawa, Ontario had lost its World Record title which it had held since 1971. Then in 2008 the rivers beat their own record which made the longest rink go to about 9.3-kilometres. The Rideau Canal still held the record for the "world's largest naturally frozen ice rink" by the Guinness Book of World Records because "its entire length receives daily maintenance such as sweeping, ice thickness checks and there are toilet and recreational facilities along its entire length". In 2013 the Assiniboine Credit Union River Trail lost its record to the Lake Windermere Whiteway at Invermere, British Columbia, Canada. The length of the skating trail at The Forks changes each year, depending on river and ice conditions, although a concerted effort is made to make it as long as possible. In the winter of 2010/2011, conditions on The Assiniboine River made it impossible to safely create skating westward, so the path extended instead south on the Red River. Essentially, the water level and the weather at the time of freeze-up will impact the way the ice forms (see frazil ice, for example), how stable it will be, and how smoothly it can be made for skating. Much of the local river ice in Winnipeg in the winter of 2010/2011 was too rough to form a skating surface. There is also a skating trail made overland which is not impacted by river conditions. There are also walking and ski trails running parallel to the skating trail. The Assiniboine Riverwalk follows along the riverbanks from underneath Esplanade Riel to the grounds of the Manitoba Legislative Building. The Riverwalk is often closed due to river flooding in springtime. From the construction of the walkway to the summer of 2011, the walkway has been submerged beyond access for part of the summer for 16 out of 21 years. "Balance of Spirit Within" is a granite stone sculpture weighing approximately 10 tonnes, and is located on the north side of the Forks Historic Rail Bridge. The Broadway Promenade is a pedestrian walkway connecting the Esplanade Riel pedestrian bridge to Union Station and Broadway Avenue. Designed by Scatliff+Miller+Murray, the design incorporates two pathways which cross the site. One pathway re-established the historic Broadway/Provencher Boulevard connection, and the other is a winding pathway representing pre-European contact era. There are often buskers in and around the Forks. Buskers perform at stations known as "Busk Stops". They are paid by donation, but are prohibited from suggesting donation amounts or requesting contributions. There is an annual competition called the "Scotiabank Busker's Festival" at which it is decided who will be allowed to Busk. 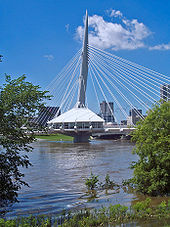 Named in honor of Louis Riel, Esplanade Riel is a pedestrian-only side-spar cable-stayed bridge which spans the Red River connecting downtown Winnipeg with St. Boniface, and it is paired with a vehicular bridge, the Provencher Bridge. The Esplanade Riel is the only bridge with a restaurant in North America, and since July 2015 is occupied by Mon Ami Louis. Former leasees include Salisbury House, a local Winnipeg chain restaurant, and Chez Sophie. The Scotiabank Stage is an outdoor stage with adjoining greenspace, built along the Broadway Promenade. In 2012, the signature events at the stage included Winnipeg's Pride Parade festival, Aboriginal Day Live hosted by APTN, Canada Day activities and the Folklorama Kick-Off. The posts on the canopy between the Forks Market and Johnston Terminal have bands on them to commemorate the peak water levels of major floods. Starting from the bottom of the posts, the bottom marker represents the 1950 flood, the middle marker represents both the 1852 and 1997 floods, and the top the flood of 1826. The flood line markers on one of the posts have historic plaques with information on the floods they represent. Positioned along the Assiniboine Riverwalk, the historic port offers river vessel docking and rental, as well as access to the Splash Dash Water Bus. During times of flooding Splash Dash Water Bus employs a moveable ramp and floating dock system that allows it to operate in high water conditions. Located directly in between the Forks Market, and Johnston Terminal, the Forks Market Plaza features fountains, canopies, dancing programs, several open performance spaces and patios. In the winter, the Plaza is home to an artificially cooled skating rink, under a canopy and lights. The Forks National Historic Site of Canada is a 9.0 acre (3.63 hectare) park dedicated to "preserving and presenting the 6,000-year history of human presence and activity at the junction of the Red and Assiniboine Rivers", and is operated by Parks Canada. The site features interpretive exhibits, sculptures, year-round walking trails, a dock, a canoe beach, a native prairie garden and a riverside amphitheatre for performances and events. Walking tours and presentations are offered throughout the summer. Built in 1888, the rail bridge was abandoned and eventually converted into a lighted crossing for pedestrians, cyclists and skaters. The mural on the side of the rail bridge is entitled "Jackson Beardy — Woodlands Group of Seven Tribute", and was painted in 2006 for Graffiti Gallery's Winnipeg International Mural Festival. The 30 foot wide and 20 foot tall mural pays tribute to Cree artist Jackson Beardy as well as the other members of the Indian Group of Seven. Oodena Celebration Circle is a natural shallow amphitheatre located between Johnston's Terminal, the Manitoba Children's Museum, and the Red River Riverwalk. "Oodena" is Cree for "centre of the city". Commissioned in 1993, the site was designed by the firm of Hilderman Thomas Frank Cramm. The location features sculptures, a sundial, interpretive signage, a naked eye observatory and a ceremonial fire pit. The circular amphitheatre is 60 metres (200 ft) in diameter and 2.5 metres (8.2 ft) deep. The 3 metres (9.8 ft) excavation for the site unearthed what is referred to by local archaeologists as “the archaic horizon”, a 3,000-year-old layer of soil rich in artifacts. The site has been used as a meeting grounds for such varied events as "No Stone Unturned", a free concert in honour of Manitoba's missing and murdered women, as well as the 2011 opening night location for THIN AIR, the Winnipeg International Writers Festival and as the meeting location for Winnipeg's Zombie Walk 2012. The Forks is home to the 1999 Pan Am Games Monument. Located beside the Inn at the Forks, the monument recognizes the governments, companies and individuals who supported the 1999 Pan American Games in Winnipeg. The monument served as the flame cauldron for the games. The 1999 Pan Am Games mainstage concerts were held at the Scotiabank Stage and Festival Park. The "Peace Meeting Site" is a landscaped resting area along the Broadway Promenade, featuring Aboriginal and European elements, notable for having two gigantic Adirondack chairs. The Forks has a Prairie Garden, which is a natural wild garden with over 10,000 plants in over 150 native plant species, including 38 prairie plants such as prairie crocus, wild iris, bergamot, purple prairie clover and wild columbine. In collaboration with Winnipeg-CORE, the public orchard at The Forks contains 61 fruit trees including apple, apricot, cherry, pear, and plum, which the public can pick to eat from when the fruit is ripe. There are as many as 75 fruit bearing shrubs packed with all types of berries to pick from during the summer days. There are also many education sessions through Winnipeg-CORE that are open to the public, as part of The Fork's Target Zero initiative. Just outside The Forks Market are two completely restored turn of the century rail cars. One car is for display, while the other is home to "Sugar Mountain Express", a candy store. Officially opened 30 June 2006, "The Plaza" is the largest urban skate plaza and bowl complex in Canada. Announced in 2005, it was built with money donated from the J.W. Burns Family Foundation. The skatepark includes a 30,000-square-foot (2,800 m2) skate plaza, and an 8,500-square-foot (790 m2) 'bowl complex'. The design features 'skateable' artwork, and is built to tolerate the regular use and enjoyment of skateboarders and cyclists. The park was also designed to integrate into the urban architecture of the city. It was designed by Landscape Architecture firm: van der Zalm + associates inc. of Vancouver, BC with key team members, New Line Skateparks and Scatliff Miller Murray as the local landscape architects. "Skate Patrol" are experienced skateboarder staff members that tour the park from dawn to dusk to educate skaters on the park's etiquette. In winter, this area features a small snowboarding facility. In 2006, the park was visited by professional skateboarder Tony Hawk to shoot scenes for his movie release Secret Skatepark Tour 3. The Variety Heritage Adventure Playground is an educational play structure for children, featuring water park elements. "Wall Through Time" is a sculpture depicting the history of the Forks, which features two bronze shells and a limestone centrepiece. The sculpture is located on the western edge of a major North American archeological find. The Forks hosts over 200 third-party and signature events throughout the year, most of which are free. Canada Day at the Forks is an all day event, with activities happening throughout the Forks grounds, and culminating in a fireworks show. Salsa Sundays is a weekly event run at the Forks under the canopy during the summer, featuring free dance instruction and demonstrations set to live Latin music and DJ mixes. The Winnipeg International Children's Festival is a children's festival held annually at The Forks National Historic Park. Founded in 1983, it was held at Assiniboine Park, then at Kildonan Park from 1984 through 1989, and eventually moving to its present location in 1990. The festival is made up of over 30 acts, held over four days, totalling about 120 performances. The following projects are part of the ten year revitalization plan for The Forks. ^ The Forks. Canadian Register of Historic Places. Retrieved 16 June 2012. ^ "A Walk Through the Site". The Forks National Historic Site of Canada. Parks Canada. 22 June 2009. Archived from the original on 18 June 2015. Retrieved 5 September 2012. ^ a b c d e f g "History". Retrieved 7 August 2012. ^ a b c "The Forks of The Red and Assiniboine Rivers A Brief History". Parks Canada. Archived from the original on 20 June 2015. Retrieved 8 August 2012. ^ a b "The Forks Market". Retrieved 7 August 2012. ^ "The Forks Market Tower". Retrieved 7 August 2012. ^ MacPhee-Sigurdson, Ben (17 February 2018). "The Common touch". Winnipeg Free Press. Retrieved 21 October 2018. ^ a b "Johnston Terminal Building". Virtual Heritage Winnipeg. Retrieved 9 September 2012. ^ "25 FORKS MARKET ROAD – JOHNSTON TERMINAL BUILDING (NATIONAL CARTAGE BUILDING)" (PDF). City of Winnipeg. 1987. Archived from the original (PDF) on 23 September 2012. Retrieved 9 September 2012. ^ "Dining at The Forks". Retrieved 7 August 2012. ^ "Johnston Terminal Antique Mall". Retrieved 7 August 2012. ^ "Travel Manitoba - Visitor Information Centres". Parks Canada. 27 August 2012. Retrieved 9 October 2012. ^ "Children's Museum". Retrieved 7 August 2012. ^ a b Vesely, Carolin (2 June 2011). "Bigger, better Children's Museum set to reopen after $10-million makeover". Winnipeg Free Press. Retrieved 6 October 2012. ^ "Manitoba Theatre for Young People". The Forks. Retrieved 10 October 2012. ^ "MTYP History". MTYP. Retrieved 10 October 2012. ^ "MISSION STATEMENT & MANDATE". MTYP. Retrieved 10 October 2012. ^ "Classes at MTYP". MTYP. Retrieved 10 October 2012. ^ "Aboriginal Arts Training & Mentorship Program". MTYP. Retrieved 10 October 2012. ^ "Archeology report criticizes human rights museum". CBC News. 19 December 2011. Retrieved 8 August 2012. ^ a b "Inn at the Forks". PCL. Retrieved 9 October 2012. ^ "Inn at the Forks". Retrieved 7 August 2012. ^ "Inn at the Forks". Smith Carter. Archived from the original on 10 September 2013. Retrieved 9 October 2012. ^ a b "Arctic Glacier Winter Park". Retrieved 9 August 2012. ^ "The Battle to Build the World's Largest Ice Skating Rink". www.basementgeographer.com. Retrieved 30 July 2014. ^ "Largest naturally frozen icerink". Guinness World Records. Retrieved 29 July 2014. ^ "Guinness World Records has confirmed it! Ottawa offers the Largest Skating Rink in the World". www.canadacool.com. Retrieved 30 July 2014. ^ "Longest ice skating trail". Guinness World Records. Retrieved 29 July 2014. ^ "Warming Huts". Retrieved 29 November 2012. ^ "Warming Huts v.2012: An Art + Architecture Competition on Ice". The Forks. Retrieved 29 November 2012. ^ "Warming huts get international nod for innovation". Winnipeg Free Press. 25 September 2012. Retrieved 29 November 2012. ^ Corporation, Forks North Portage. "About | Warming Huts a competition on Ice". www.warminghuts.com. Retrieved 21 October 2018. ^ "Assiniboine Credit Union River Trail is Closed for the Season". Retrieved 19 July 2014. ^ "Mingle: Your guide to all Things Downtown". Retrieved 19 July 2014. ^ "Warm weather closes the ACU River Trail". Archived from the original on 25 July 2014. Retrieved 19 July 2014. ^ "THE FORKS SKATING TRAIL NOW OPEN". Retrieved 19 July 2014. ^ "World's largest naturally-frozen skating trail opens in Winnipeg". Retrieved 19 July 2014. ^ "Working on our suntans in mid-March". Retrieved 19 July 2014. ^ "Entire Forks River Trail closed for the season". Winnipeg Free Press. 27 February 2013. Retrieved 19 July 2014. ^ "River trail skating path now open". Winnipeg Free Press. 10 January 2014. Retrieved 19 July 2014. ^ "10 weird facts about the Forks river trail in 2014". CBC. 11 March 2014. Retrieved 19 July 2014. ^ "River trail open for ice-skating". Winnipeg Free Press. Retrieved 1 January 2015. ^ "Forks river trail closed for the season". Winnipeg Sun. Retrieved 11 March 2015. ^ "Red River Mutual Trail now open from The Forks to St. Vital". Winnipeg Free Press. 3 February 2015. Retrieved 5 February 2015. ^ "Riverwalk". Retrieved 7 August 2012. ^ Romaniuk, Ross (4 May 2012). "River walk actually open, no really". Winnipeg Sun. Retrieved 7 August 2012. ^ "Flood risk low in Winnipeg". CBC News. 27 February 2012. Retrieved 7 August 2012. ^ Kives, Bartley (3 September 2011). "Nice to see you again, river walk". Winnipeg Free Press. Retrieved 9 September 2012. ^ "Riverwalk emerges after 80 soggy days". Winnipeg Free Press. 12 July 2014. Retrieved 12 July 2014. ^ "Assiniboine river walk temporarily closed from Osborne to Main". The Carillon. Archived from the original on 2 April 2015. ^ "Balance of Spirit Within". Retrieved 8 August 2012. ^ "Broadway Promenade". Retrieved 8 August 2012. ^ "The Forks Broadway Promenade". Scatliff+Miller+Murray. Archived from the original on 15 January 2013. Retrieved 21 August 2012. ^ "Buskers". Retrieved 8 August 2012. ^ "Esplanade Riel Pedestrian Bridge". Tourism Winnipeg. Archived from the original on 28 May 2012. Retrieved 8 August 2012. ^ "Toilet gets mayor in hot water with Taxpayers". CBC News. 19 May 2003. Retrieved 8 August 2012. ^ "Winnipeg's Legendary Salisbury House Celebrates its 80th Anniversary in 2011". Archived from the original on 12 April 2012. Retrieved 9 August 2012. ^ "Festival Park and Scotiabank Stage". Archived from the original on 26 August 2012. Retrieved 8 August 2012. ^ "Summer on the Scotiabank Stage". The Forks. Retrieved 9 October 2012. ^ a b "The Forks Top Ten". Parks Canada. 20 September 2012. Retrieved 8 October 2012. ^ "High Level Marks – Red River – Winnipeg MB". Waymarking.com. Retrieved 8 October 2012. ^ "The Forks Historic Port". Retrieved 9 August 2012. ^ a b "The Forks Market Plaza". Retrieved 9 August 2012. ^ a b "The Forks National Historic Site of Canada". Retrieved 7 August 2012. ^ "The Forks Historic Rail Bridge". Retrieved 7 August 2012. ^ a b c d e "The Fork's Oodena Circle and Naturalized Prairie Garden". Retrieved 8 August 2012. ^ "Oodena Celebration Circle". Retrieved 7 August 2012. ^ a b "Oodena Celebration Circle, The Forks". Alpha Masonry. Archived from the original on 3 December 2013. Retrieved 8 October 2012. ^ a b "Oodena Celebration Circle". Hilderman Thomas Frank Cram. Archived from the original on 3 October 2012. Retrieved 8 October 2012. ^ "Media Advisory – For Immediate Release". Native Women's Association of Canada. 12 July 2012. Archived from the original on 15 January 2013. Retrieved 8 October 2012. ^ "Opening Night: Voices from Oodena". THIN AIR. Archived from the original on 7 March 2012. Retrieved 8 October 2012. ^ "Zombie Walk 2012 - Oct 13". WinnipegZoom. 3 October 2012. Retrieved 8 October 2012. ^ "Pan Am Games Monument (The Forks, Winnipeg)". Manitoba Historical Society. Retrieved 17 January 2013. ^ "Festival Park and Scotiabank Stage". The Forks. Retrieved 7 December 2014. ^ "Peace Meeting Site". Retrieved 8 August 2012. ^ "Prairie Garden". Retrieved 8 August 2012. ^ "Urban Gardens To Produce Fresh Ingredients At The Forks". CBC News. 24 January 2014. ^ "Winnipeg The Forks". Retrieved 9 August 2012. ^ "Rail Cars". Retrieved 9 August 2012. ^ "Skateboard Plaza Grand Opening". Archived from the original on 2 August 2012. Retrieved 7 August 2012. ^ "The Plaza at The Forks". Retrieved 7 August 2012. ^ New Line Skateparks. "Plaza at The Forks". New Line Skateparks. ^ "PLAZA AT THE FORKS - WINNIPEG, MB". New Line Skateparks Inc. Retrieved 7 August 2012. ^ "The Plaza at the Forks" (PDF). Archived from the original (PDF) on 26 June 2013. Retrieved 7 August 2012. ^ "Welcome to the Variety Heritage Adventure Park" (PDF). Retrieved 8 August 2012. ^ "Wall Through Time". Retrieved 8 August 2012. ^ "Wall Through Time". Tourism Winnipeg. Archived from the original on 4 February 2013. Retrieved 21 August 2012. ^ "Signature Events". Retrieved 7 August 2012. ^ "Canada Day at The Forks presented by Rogers". Archived from the original on 9 August 2012. Retrieved 7 August 2012. ^ "Salsa Sundays". Retrieved 9 August 2012. ^ "History". Winnipeg International Children's Festival. Retrieved 14 August 2012. ^ "Winnipeg International Children's Festival". The Forks. Archived from the original on 5 August 2012. Retrieved 14 August 2012. ^ "BUILDING CONNECTIONS 2010–2020". Retrieved 9 August 2012. ^ "The Rail Side Lands and Parcel 4 Planning Initiative". The Forks. Retrieved 2 January 2014. ^ "Upper Fort Garry Heritage Park & Interpretive Centre". Retrieved 9 August 2012. ^ "South Point". Retrieved 9 August 2012. ^ "Promenade Lighting Strategy". Retrieved 9 August 2012. ^ "The Forks Sculpture Program". Retrieved 9 August 2012. ^ "Waterfront Vision". Retrieved 9 August 2012. ^ "Winnipeg The Forks". Environment Canada. Retrieved 26 May 2016. Wikimedia Commons has media related to The Forks.